At the end of an intensive 10-day meeting, World Intellectual Property Organization member states were unable to agree on the UN agency’s program and budget for the 2014-2015 biennium, leading to suspension of the meeting at about midnight on the last night. An extraordinary meeting was called for December to finish the work before the end of the current biennium on 31 December. “Even by UN standards, which are extremely low, this assembly sets a new low,” a delegate from the United States told the plenary meeting. Members spent most of the past few days including the weekend sequestered in closed, small rooms trying to agree on text. They managed agreements on most of the agenda, such as the renewal of the mandate of the Intergovernmental Committee on Genetic Resources, Traditional Knowledge and Folklore (IGC), progress reports on various construction and upgrade projects, and the reports of several negotiating committees. But a few issues that could not be resolved despite days of intensive negotiation, including aspects of the program and budget for the next biennium, the holding of a diplomatic conference for a design law treaty, the workplan for the Standing Committee on Copyright and Related Rights (SCCR), and governance at WIPO. The draft decision on the program and budget is available here [pdf]. The draft decision on the Design Law Treaty is available here [pdf]. A key issue for the program and budget is making the WIPO Global Challenges Division accountable to a WIPO committee so that members can have more direct say over the section’s work, as with most other WIPO activities. The division is working on issues such as IP and public health, climate change and food security. Perhaps most talked about was a WIPO secretariat plan to open new external offices in five countries, which became political. The secretariat earlier this year proceeded to sign contracts with Russia and China before bringing its plan to the membership in July, and the reaction has been strong. A range of other members have demanded that they also get offices, which are seen as giving a boost to patenting and innovation in the host countries. And especially, they demanded the creation of guidelines for the establishment of such offices, which is what took much of the negotiating time this week. Another unresolved issue is the report of the Committee on WIPO Standards (CWS). Delegates seemed stunned by the inability to finish the Assemblies. At a few minutes before midnight, the Assembly chair called regional coordinators to the podium to discuss with Gurry and his team. The decision was to hold an extraordinary General Assembly sometime in December to finish the remaining items (not reopen decided items). Delegates noted the possible conflict with the World Trade Organization Bali ministerial in early December. “It’s a pity. We were close,” a delegate told Intellectual Property Watch after the meeting. “There is a serious problem of governance,” the delegate of France said during the plenary, when WIPO is finishing work at midnight and more critical human rights meetings can get done earlier. However, several delegations stepped up to defend the WIPO secretariat. India, Ghana and others said that if the work was not done it was the fault of member states who could not finish, and that blame should not be shifted to the secretariat. In general, developing countries have been insistent on inclusion of stronger development principles in WIPO’s work, while developed countries have been digging in their heels, facts which might be reflected in the difficulty in getting agreement. 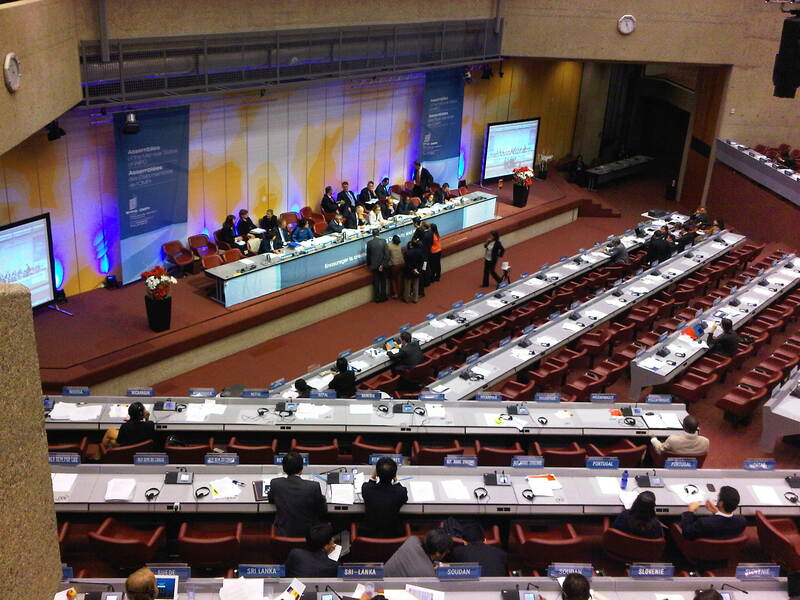 The WIPO General Assemblies were held from 23 September to 2 October. An underlying issue during the week was the beginning of an election year for the next director general of WIPO. The US questioned whether there was a quorum in the room as it seemed empty at the late hour. It was determined that only a third of WIPO members had to be present and this was found to be the case after a count. Other IP-Watch reporting on the Assemblies is here, here, here, here and here. "WIPO Annual Assembly Breaks Down; Extraordinary Meeting Eyed For December" by Intellectual Property Watch is licensed under a Creative Commons Attribution-NonCommercial-ShareAlike 4.0 International License.